A pressure washer is big and bulky but it does nothing more than pack a lot of water into a wand or an outlet. Without the right kind of spray heads, your pressure washer is really of no use. It will have a single setting that won’t be effective in all kinds of applications. However, with the 5 universal color coded tips, you can actually alter the pressure, spray pattern and application based on your requirement. 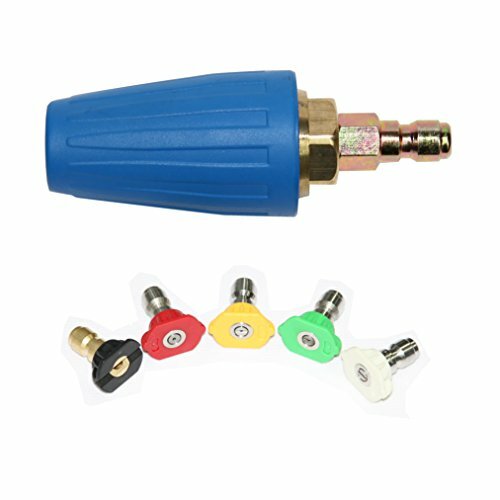 Each of the 5 pressure washer nozzles and tips produces a different pattern of spray and pressure that makes it suitable for varied cleaning purposes whether you’re using a budget pressure washer or you’ve scouted around the site and bought one of the best pressure washers. Here we introduce the 5 universal tips as well as give an additional tip that you can purchase. A RED tip produces a 0 degree highly concentrated spray that is very powerful even on a commercial grade inexpensive pressure washer. With this tip you must be mighty careful as it has enough pressure to damage sensitive or fragile surfaces. They are best used to clean concrete and metallic surfaces off caked grime and dirt. Ensure that you do not use this tip close up to the surface. It can even scratch metallic surfaces such as those found on grills and cars. A yellow spray tip throws water in a 15 degree spray pattern. This is excellent for heavy duty cleaning. It works well with concrete, garage floor, walls and even roofs and drains. However, for detergent based or chemical based cleaning, this is not the most suitable tip as it can cause the chemicals to embed deep within the material’s cracks and crevices. A Green tip uses a 25 degree spray pattern that is most suitable for cleaning decks, walkways, brick patios and even furniture. Cleaning a boat or ship with chemicals or washing cars with detergent requires a green tip as it produces just the right amount of GPM and PSI required for the job. A white tip is also called a 40 degree tip because it produces a spray pattern of 40 degrees. This tip is most suitable to clean delicate surfaces such as stucco walls, home sidings and glossy surfaces. It does not produce a lot of pressure but has got the requisite water flow to get the job done. The White tip can be used with just about any kind of surface and with any pressure washer. A black tip generates a spray pattern of 65 degrees and it covers the most area with a very gentle stream. This tip is not suitable for cleaning purposes rather it is used to wet surfaces to apply chemicals or detergents. With hard to reach surfaces such as soffits, under the deck, gutters and wheel wells, cleaning using any of the 5 universal tips is a hard task as the wand cannot bend enough and yet maintain the same pressure. 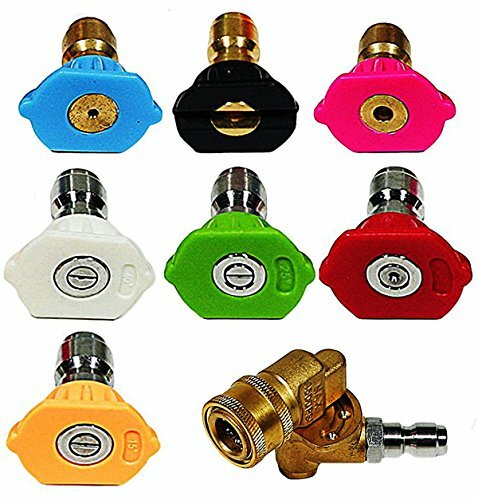 A pivoting nozzle however lets you access such regions with ease. Perfecting your soft wash technique will save you time and money. These 2 pressure wash tips are all I need. Want More Pressure Wash Videos? A pivoting nozzle wand makes use of all the 5 universal tips but the wand itself can bend at the front in either direction up to 90 degrees. This lets you access deep crevices, cracks and hidden areas with ease while using any of the universal tips. A pivoting nozzle wand never comes as part of a pressure washer kit, you have to purchase this attachment separately.